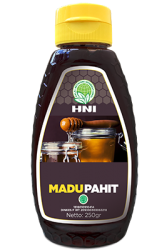 Madu Pahit HNI is a honey with a distinctive bitter taste because it is produced by Apis dorsata bee which consumes nectar from bitter tree buds like the kirinyuh plant, teak tree, mahogany tree, parasite plant and Clidemia hirta plant or soapbush. Madu Pahit has high alkaloid content. This substance serves as a natural anti-bacterial that can kill various bacteria that can harm the body.